Now i can deploy all project or remeber updated files in brain and deploy one by one. Please always describe your project setup. Then provide step-by-step instructions on what are you doing, why and both expected/desired and actual results. In this case its completely unclear what are you trying to "deploy" and where to. Я считал, что это деплой без анализа обновленных файлов - это нормальное, исторически сложившееся явлениe. И моя писанина не более чем пожелание разработчикам и уточнение, работает или нет (вдруг опцию не заметил). А из ваши слова вроде как не отрицают тот факт, что процедура деплоя предварительно может произвести анализ проекта и залить на удаленный сервер только обновленные файлы. изменил 10 файлов файлов и получил на выбор - либо заливать все поверх, либо вспомнить какие файлы поменял и залить их по одному. Это так? Можно как-то залить только измененные? Надеялся сделать это через tool window - change – но похоже там список файлов измененых по отношению к системе контроля версий. Web IDE has two options (at Settings | Deployment | Options dialog): to keep files timestamps (by default (S)FTP server resets it to the current time) and to skip (=don't upload) up-to-date files. The file is considered as up-to-date if it has the same size and timestamp as the source one. 1. If you commit directly from Web/PhpStorm, you can check checkbox 'Upload to ...' in the commit window. See image below. a) Go to Changes Tool window - Repository tab. Also you can assign shortcut to upload action as I did (see Alt+U on the screenshot). Please note that when you're selecting changelist from the history view (as you do on the screenshot), Web IDE will upload the current version of the files, that may be different from the version you've selected. Yes, I know. 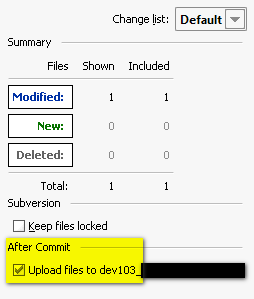 But in most cases you should upload changed files right after commit. Therefore this WebIDE feature is very helpful. Btw, you can vote for http://youtrack.jetbrains.net/issue/WI-709 . In some cases this feature can be useful. 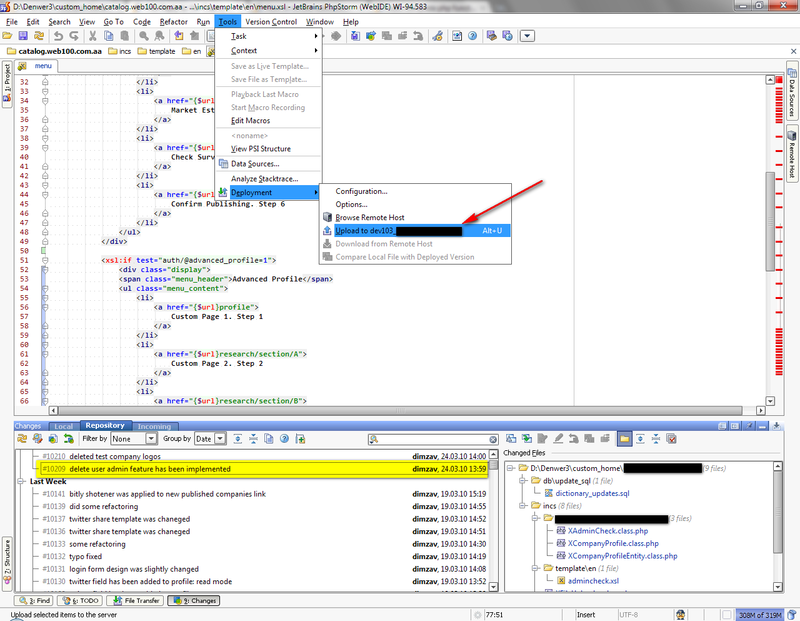 For example, when you need to debug some code which works on the local PC but doesn't work on the server. Or when you work without CVS project integration. It is common case in small projects.